The key to keeping boredom at bay and your road trip rolling smoothly is to put a few things in place ahead of time and keeping a couple of surprises up your sleeve. Before you head out, make sure you have the major bases covered and you’ve chosen a place to stay that you can trust to have the amenities that you and your kids need and love. For us, free breakfast, free Wi-Fi, and a chain that we can rack up points at are our top priorities—it ends up saving us about $50 — $100 a day. I know it sounds crazy, but breakfast for four can cost up to $50, and hotels that still charge for Wi-Fi charge around $15. Add that to the occasional free nights we get from loyalty programs, and it all adds up to big savings. Plus, knowing what to expect when you arrive at your destination is key to us being able to relax and enjoy the trip. Fun on vacation starts from the minute you decide to head out! Here are 31 tried and true travel tips for maximizing the fun with your kids when we hit the road—I’d love to hear any of yours in the comments below! 1. Do your research. Use Roadtrippers to help you map out your trip ahead of time so you know where to stop and take in the sights. Their website and app can help you find interesting landmarks, natural wonders, and even weird stuff along your route. 2. Don’t forget the snacks! I think we all know road tripping is all about the snacks, so make them count. Pack a few favorites and let your kids each pick out one new one to try. To further up the excitement level, pack them in a tackle box or lined bento box. 3. Let the kids help pack their bags. Heaven forbid, you should hit the road without the correct dump truck or princess pet. Let your kids weigh in on what they’re into right now and save the drama. 4. Add in a couple surprises. It never hurts to have a few tricks up your sleeve. Hit the dollar store before the trip for stickers and coloring books or the grocery store for candy necklaces and Ring Pops to pull out when things start going south. 5. Get the kids on board. Spend time talking beforehand about how much fun you’re all going to have in the car, and set the expectation that road trips are awesome. Ask them to help with the packing and planning so they’re totally invested in the idea. 6. Pack each kid a pillow in an old pillowcase. Naptime is way easier with a comfy place to rest their heads. Plus, add a cookie sheet to the top and you’ve got yourself a makeshift portable tray table. 7. Kick things off with a pajama party. Every kid knows, life is way more fun in your PJs. 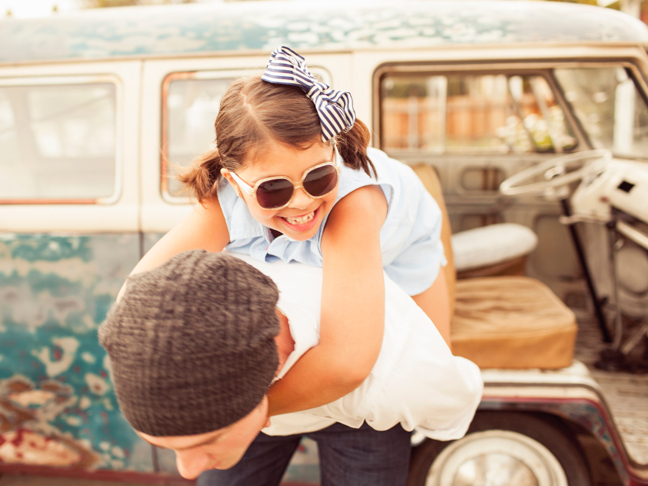 Take the kids straight from bed to the car and let them relax the morning away. You can “get ready” for the day at one of your rest stops, which will add to the novelty of the experience. 8. Have an old-fashioned sing-along. Is there a person in your family who doesn’t know every word to Let It Go? That’s what I thought. Use this knowledge to your advantage and encourage everyone to belt along (louder is always better on a road trip). 11. Introduce your kids to the car games that have taken families from point A to point B for generations: I Spy, 20 Questions, Two Truths and a Lie, and Pack Your Bags. 12. Designate a Mayor of the Hour. Give everyone one hour where they get to be in charge of major decisions (within reason, of course). This could include: where to eat for lunch, music choices, where everyone gets to sit, whether the windows stay up or down, and where exactly the center line is. 13. Pick out an audiobook to listen to as a family. Audible.com has a great list of family-friendly books to get you started or check out Travel Savvy Mom’s list of audiobooks for kids, broken down by age. 15. Take full advantage of your rest stops and let the kids burn off some energy. Play tag, have a quick running race, or just chase them around the parking lot to “get the lead out,” as my dad used to say. 16. Put on music that everyone can seat-dance to. Alphamom has a great playlist of upbeat songs for the whole family, or check out Take Lessons’ list of 150 Best Songs to Sing Along To, which is guaranteed to have something for everyone in the family (“Sweet Home Alabama,” anyone?). 17. Create a roving art gallery. Give the kids a stack of paper and a pack of (washable) markers and let them create an art series. Tape the masterpieces to the windows for a traveling art show (and a great way to block out the sun). 18. Have the kids wave to people along the way. Growing up, one of the most thrilling things that could happen to us on a road trip was when a trucker would honk his horn. Take it one step further and wave to other cars and see if anyone waves back. At the very least, it’ll create goodwill along the road. 19. Find something that starts with each letter of the alphabet. There’s nothing like a little family competition to keep things interesting, am I right? Challenge each family member to spot something starting with each letter of the alphabet. For kids just learning to read, ask them to find each letter (in alphabetical order) on signs as you go. 20. Ask a series of questions each family member answers. They can be anything from “Who is your best friend?” to “What was the best day you’ve ever had?” to “Tell me about your favorite food.” The key is everyone gets to answer and ask follow-up questions. 21. Tell a crazy story with the whole family. Come up with a random sentence to start (“Once there was a witch who really loved bubble baths”) and then have each member add one sentence to the story at a time. 22. Print out a car game to keep them occupied. Mom’s Minivan has a great Car Bingo everyone in the family can play, while Mud Pie Makers has a picture Bingo for non-readers, and Mini Time has just about every car game you can think of. 23. Be flexible. If you have the time, take your time! Take advantage of local sights and attractions by keeping your eyes open. Stop at side-of-the-road fruit stands, check out one-of-a-kind museums, and eat at local diners and restaurants. 25. Don’t forget to use the pool. This one is a total no-brainer, but make time for the pool. Toss in a pair of goggles, give your kids some loose change to dive for, and you’ve got yourself an evening’s entertainment. 26. Don’t forget to bring the lovies. Sleeping in a new place can be a little stressful, especially for little ones. Keep bedtime routines (bathing, singing, and stories) the same and make sure to pack their favorite comfort toys for sleeping. 27. Talk in the dark. It might mean going to sleep a little early, but the giggling and secrets will make it worth it. Hop in bed, turn out the lights, and have a family chat. 28. Have a family sleepover. Get everyone into their PJs, pull out the treats, and have everyone snuggle into one bed for a family movie night. 29. Put the kids in charge of the door key. Kids love extra responsibility, so let them take charge of the key. While you probably want to hold onto it when you’re out and about, once you hit the hotel, hand it over and let them run ahead to get the room open and ready for you. 30. Take turns sleeping in different beds. Sleeping in a hotel bed is exciting, but getting to sleep with Mom or Dad? Over-the-moon! Take turns sleeping in different arrangements so everyone gets a chance to get kicked by each kid. 31. Have the kids eat breakfast on their own. Hampton Inn stays come with a free hot breakfast, which is a great opportunity for your kids to show a little independence. Let them make their own waffles or oatmeal (with supervision, of course), and then let them sit at their own table for a grown-up breakfast experience. Before kids, Kara was the sort of gal who backpacked around Europe in heels (true story), rocked tiny hats and really big bows (sometimes at the same time), and liked to think she was always up for an adventure. After kids, she wore yoga pants. Lots and lots of yoga pants. And worked on creating a permanent indent in her couch. She succeeded. 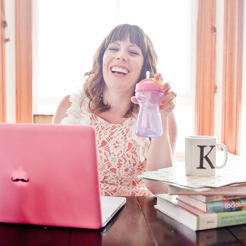 In an effort to get her groove back, she started the lifestyle blog Fabulistas, where she features glittery fabulousness for moms and their kids, brings adventure back into her life with the Fun Project, and generally makes other parents feel better about their housekeeping skills. Find her on Twitter, Facebook, Instagram, and Pinterest.